The Labino UVG Series products UVG2-5 are small and compact UV LED lights with a powerful output that offer convenience during quick inspections. Labino UVG2 is a small-sized, lightweight, UV-A LED hand held torch designed for quick inspections in “hard-to- reach” spots. The Labino UVG2 UV LED Torches are used for many uses across various industries such as in Non Destructive Testing for MPI and DPI inspections, Leak detection, Purity Control. They are used by Police forces to detect forensic traces (e.g. body fluids) at crime scenes. They are widely used in the detection of fluorescent tracer liquids (e.g.. SmartWater TM). They are also used by art galleries and museums for Art Restoration and Art Verification. The list of applications using ultraviolet light is increasing all the time. The Spotlight, Midlight and Floodlight UVG2 torch generate an intensity of approximately 25,000 μw/cm2, 10,000 μw/cm2 and 3,000 μw/cm2 respectively at 38 cm (15 inches). The running time is 4.5 hours. They weigh just 211 grams (7.4 oz). 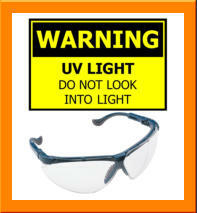 The Labino UVG3 is the exact same UV LED Torch as the UVG2 with the addition of a unique white light block filter that is not affected by solarization, for applications where the amount of visible light is critical. This filter eliminates the white light from the lamp and reduces the glare reflected from shiny surfaces i.e. aluminium, when you use the lamp along with UV Block glasses. The FLOOD and MID versions have been tested to comply with both ASTM E3022-15 and ISO 3059-12 standards. The FLOOD also complies with Airbus AITM6-1001. The Spotlight, Midlight and Floodlight UVG3 torch generate an intensity of approximately 20,000 μw/cm2, 8,000 μw/cm2 and 3,000 μw/cm2 respectively at 38 cm (15 inches). The running time is 4.5 hours. They weigh just 211 grams (7.4 oz). Labino UVG4-HEAD is a UV LED Head Lamp designed to free the user’s hands during an inspection. The lamp can be adjusted in three different angles. The operator can switch the angles of the light during the inspection. The rubber head bands are adjustable to fit helmets. The battery is located at the back and there are no cables hanging from the lamp. The UVG4-HEAD has the exact same light output characteristics etc as the UVG2 but in a head mounted version. The Spotlight and Midlight UVG4 head torch generate an intensity of approximately 25,000 μw/cm2 and 10,000 μw/cm2 respectively at 38 cm (15 inches). The running time is 4.5 hours. They weigh just just 271 grams (9.4 oz). The Labino UVG5-HEAD is the exact same UV LED Torch as the UVG4-HEAD with the addition of a unique white light block filter that is not affected by solarization, for applications where the amount of visible light is critical. This filter eliminates the white light from the lamp and reduces the glare reflected from shiny surfaces i.e. aluminium, when you use the lamp along with UV Block glasses. The MID version has been tested to comply with both ASTM E3022-15 and ISO 3059-12 standards. The Spotlight, Midlight and Floodlight UVG5 head torch generate an intensity of approximately 20,000 μw/cm2, 8,000 μw/cm2 and 3,000 μw/cm2 respectively at 38 cm (15 inches). The running time is 4.5 hours. They weigh just just 271 grams (9.4 oz). Features • UVG Torches and Headlights reach full power instantly. The on/off button is positioned at the back of the torch. Same applies for the headlights, the on/off button is positioned on the battery box at the back. Location of on/off button aims to prevent accidental activation. • The length of the torch is 15.9cm (6.3 inches) and weighs 211 grams (7.4 oz), including battery. Each headlight weigh 271 grams (9.4 oz) including battery. • Each UVG light contains one ultraviolet LED that peaks at 365nm. The life of each LED is estimated at 30,000 hours. • Same batteries can be used for both torches and headlights. Each battery has a running time of 4.5 hours (+/- 5%) and can be recharged from a normal outlet or vehicle via a cigarette lighter connection. Each light comes with an extra battery. • All UVG lights are equipped with a current regulator that keeps the UV Intensity constant even when the battery fades. • Sealed to IP65 approved for dust and temporary water jet. Your Choice… A. Torch: UVG2 (clear glass) or UVG3 (white light block filter). Headlight: UVG4 (clear glass) or UVG5 (white light block filter) B. Beam: UVG Torches are available in three different beams, Spotlight, Midlight and Floodlight. UVG Headlights are available in two different beams, Spotlight or Midlight. C. Accessories: Add a Carrying case for convenience & UV Block glasses for your safety. Add a tripod to keep your torch still during inspection. Labino UVG2 is a small-sized, lightweight, UV-A LED hand held torch designed for quick inspections in “hard-to-reach” spots. 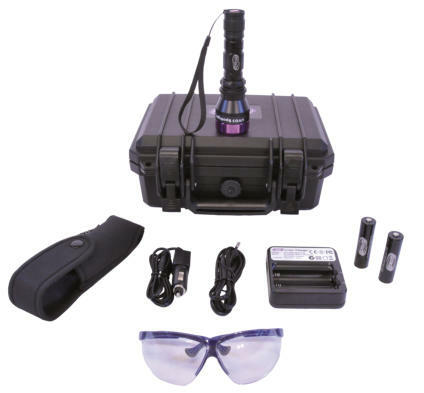 The Labino UVG2 UV LED Torches are used for many uses across various industries such as in Non Destructive Testing for MPI and DPI inspections, Leak detection, Purity Control. They are used by Police forces to detect forensic traces (e.g. body fluids) at crime scenes. They are widely used in the detection of fluorescent tracer liquids (e.g.. SmartWater TM). They are also used by art galleries and museums for Art Restoration and Art Verification. The list of applications using ultraviolet light is increasing all the time. The Spotlight, Midlight and Floodlight UVG2 torch generate an intensity of approximately 25,000 μw/cm2, 10,000 μw/cm2 and 3,000 μw/cm2 respectively at 38 cm (15 inches). The running time is 4.5 hours. They weigh just 211 grams (7.4 oz).